Le Vélo is an electric and connected bike we designed for Yellow Innovation, the creative laboratory from La Poste. Teamed up with art directors, engineers, bike-experts, bike makers, it has been shown for the first time at the CES in Las Vegas in 2017. With its slim, agile and lightweight body, Le Vélo is totally at home in the city. A particular attention has been given to the frame design, that reminds many of the legendary stylish French saloons cars. Two batteries assures it meets an urban users needs. 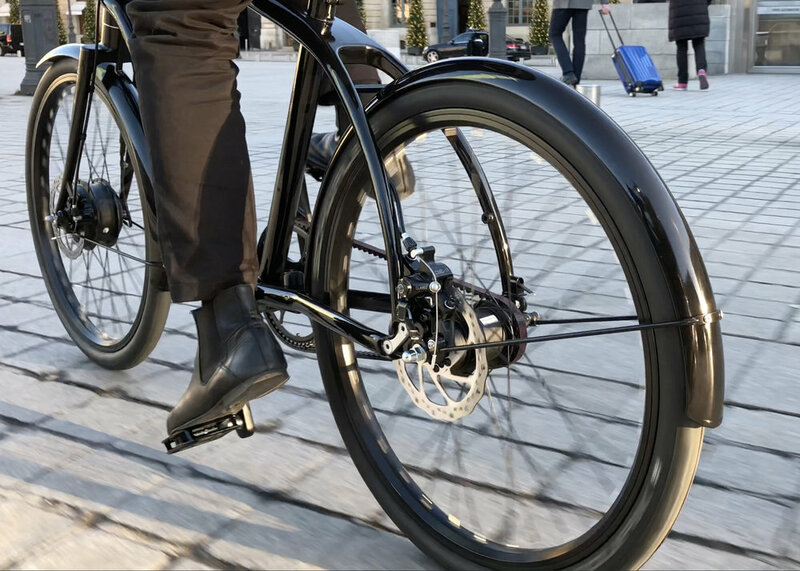 A small and extremely light "Mars bar"-sized battery pack provides 30 minutes of ride , as the average time from point A to point B in most cities is a 20-minute bike commutes. This small battery, that slips into a shirt pocket, can be easily charged using a power outlet, cigarette lighter or a computer, via USB. A second invisible battery integrated into the bike frame (down tube), allows up to 4 hours of autonomy for a more intense use. There is an on-board computer communicating permanently with the rider’s smartphone. A screen integrated into the stem displays all the essential information that the cyclist needs whilst on the move. And to create a safe experience, we’ve specially developed a user interface and interactive handlebars : three buttons are integrated directly into the brake levers.